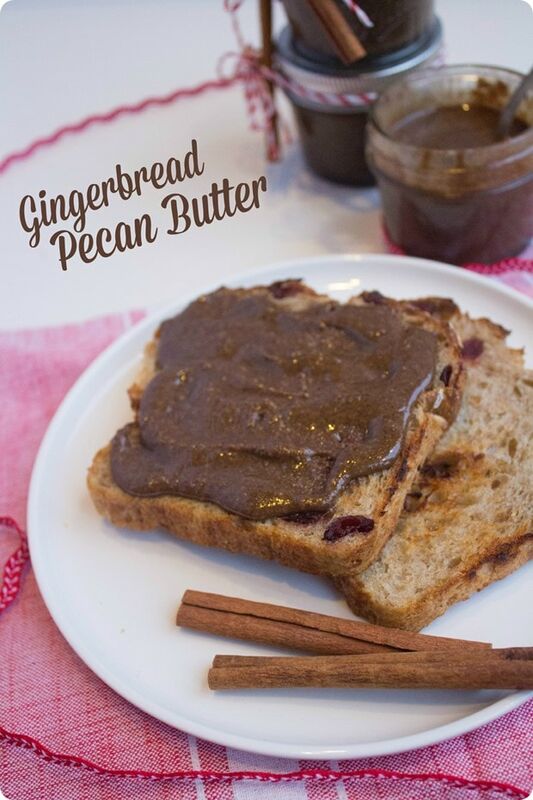 Friends – I have a new favorite nut butter: gingerbread pecan butter. Who needs sugary cookies when you’ve got this? This is my latest McCormick partnership creation (last month’s: Vegan Kale Artichoke Dip recipe <- great for holiday parties), and I promise you’ll love it, too. To make this recipe, the first step is to toast the pecans in the oven. Toasting the nuts and then processing while they’re still hot makes for a much creamier nut butter that comes together easily since the oils are drawn out, so don’t skip it! 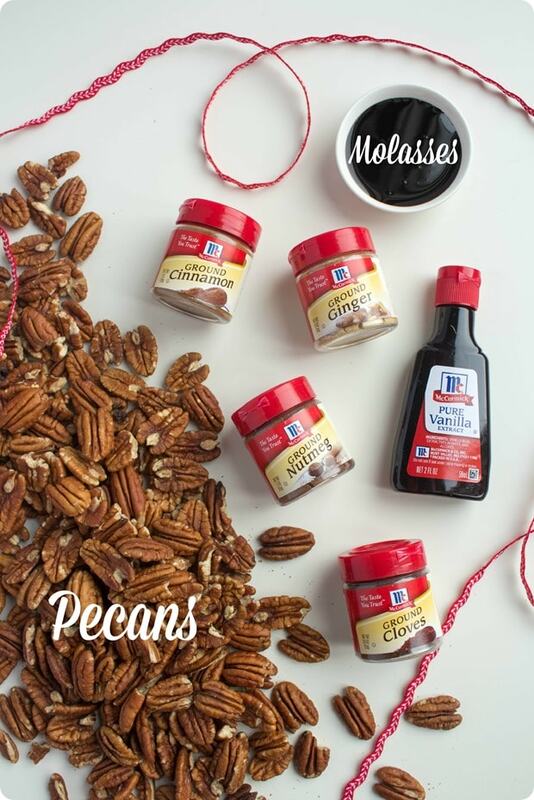 Once the pecans are toasted, the rest is easy – just toss all the ingredients into a blender together! The combination of the toasted nuts, festive spices, pure vanilla extract, and molasses come together perfectly to bring out the gingerbread flavor without needing sugar. Vanilla and cinnamon in particular just scream the holidays to me! The biggest thing to note about the food processor step of this recipe is that it takes quite awhile, so be patient! It will likely take about 10 to 15 minutes of processing for the nut butter to become smooth. 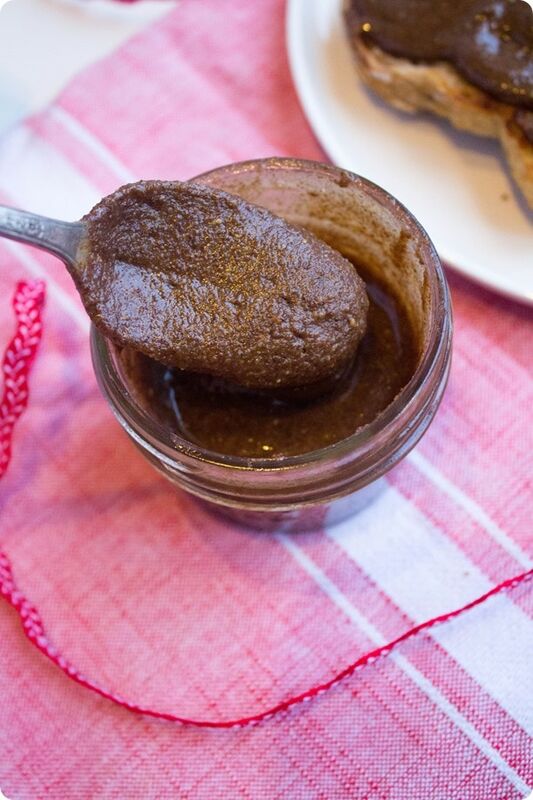 Also, adding the vanilla and molasses at the beginning of the processing is important – adding water-based liquids at the end of processing will cause the nut butter to seize up and become clumpy and thick. No bueno! Happy eating and gifting, my friends! 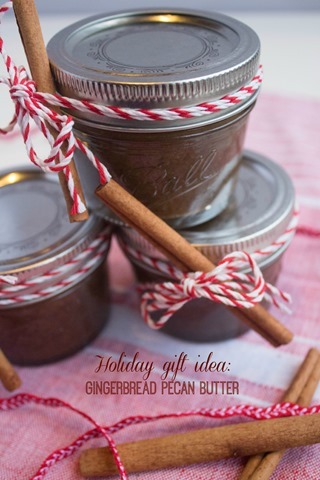 This gingerbread pecan butter makes the perfect holiday gift - or festive snack. Spread the pecan halves evenly on a baking sheet. Bake for 5-7 minutes, until fragrant and very slightly darkened but not burnt. 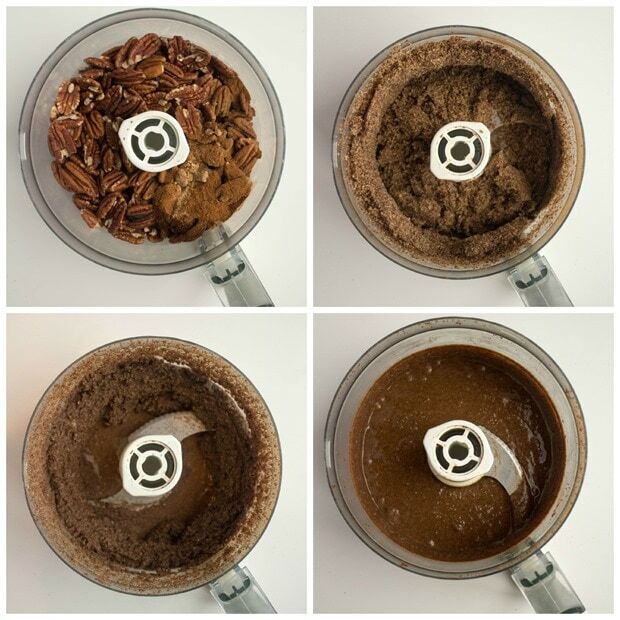 Immediately place the pecans in a food processor and add the remaining ingredients. Process until a smooth butter forms, scraping down the bowl every few minutes. The mixture will start out as coarsely chopped, then finely chopped and crumbly, then a thick puree, and finally a smooth, drippy nut butter - it should take 10-15 minutes total. Thank you to McCormick for sponsoring this post! For more creative, delicious recipes, see their website. This sounds awesome and like such a fun thing to gift to someone. Thank you! Mmmm yea! I’d eat it by the spoonful! This looks divine! I love making my own nut butters! Oh my gosh this looks amazing!!!! I love anything gingerbread and I love all nut butters, and this would be amazing in a warm bowl of oatmeal. Can’t wait to try! YUM!! This sounds and looks so good! Any suggestions for a substitute for the molasses? I live in Korea and it’s one of the (many!) things I can’t find here! You could probably leave it out… it just won’t be quite as gingerbread-y! I’ve seen gingerbread art and it’s just so amazing. Great tip about adding the cinnamon and molassas at the beginning – I never would have known the consequences of adding at the end! Sounds delicious! And I love that it can double as a festive holiday gift! This looks delicious! How long do you think it will keep for? And, does it need to be kept in the fridge? Probably a couple weeks? I always just use the “does it smell or look weird?” test, but I know that’s not super scientific. :) I wouldn’t store in the fridge as it would get hard. Enjoy! I’ve made this twice and it turned out great both times. 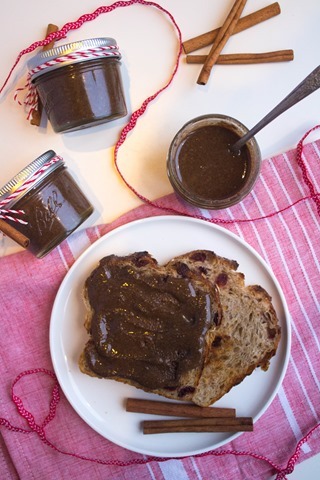 It’s terrific on raisin toast with slivered almonds and bananas. It’ll be hard to go back to almond butter when this last batch runs out! Thanks for the great recipe. FYI–I stored mine in the fridge and it stayed smooth and creamy. Excellent, that’s great to know about the fridge!